March 19, 2013 /3BL Media/ - The Children’s Hospital of Philadelphia is proud to announce a $500,000 gift from the GlaxoSmithKline (GSK) Foundation. The donation will greatly enhance the GlaxoSmithKline Hope for Families Fund, an endowment fund which was established in 2008 with a $1 million gift from The GlaxoSmithKline Foundation and GlaxoSmithKline, and matched by The Children’s Hospital of Philadelphia. This Fund provides vital assistance to financially eligible families that need assistance for travel and living expenses they may incur while their child is enrolled in investigational and/or novel treatments offered at the Cancer Center at Children’s Hospital. Click here to view an infographic about the Fund. The Cancer Center at Children’s Hospital is a Phase I institution and leader within the Children’s Oncology Group. The Center strives to provide the most skilled, compassionate care available. State-of-the-art facilities enable it to offer comprehensive, family-centered care from 69 nationally and internationally renowned pediatric oncologists and specialists. Their combined expertise spans every major form of childhood cancer. 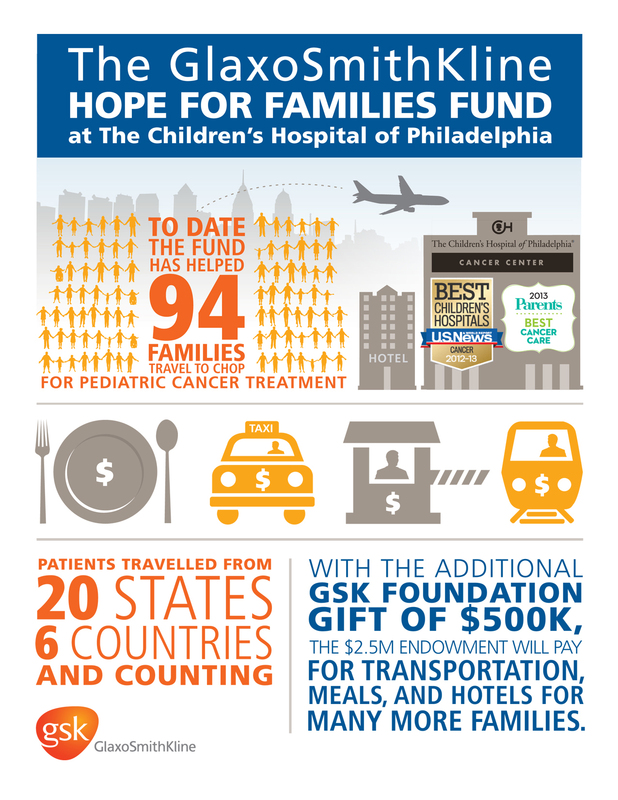 Each year, the Cancer Center treats more than 500 new patients and follows nearly 5,000 patients, making the program one of the largest pediatric cancer programs in the world. About GlaxoSmithKline: One of the world’s leading research-based pharmaceutical and healthcare companies, GSK is committed to improving the quality of human life by enabling people to do more, feel better and live longer. For further information go to us.gsk.com, follow us on twitter.com/GSKUS or visit our blog: www.morethanmedicine.us.gsk.com/blog/. Read a blog post from Dana Vass at the Cancer Center at The Children's Hospital of Philadelphia.